Written by Robert Jaeger for the Atari 800 in 1983. Squeezed into 16k from Jaeger's 48k code by Chase Sebor and Bob Halliday, and published by Parker Brothers in 1984 for the Atari 5200 and Atari 8-bit family computers. Also converted and published by Parker Brothers in 1984 for the Atari 2600, ColecoVision, Commodore 64 and IBM-PC compatibles. Converted for the Apple ][ computers by Parker Brothers and published by BCI Software in 1984. Converted for the ZX Spectrum in 1984 by Amazon Systems, and published by Parker Brothers and Sinclair Research Ltd in 1984 as "Panama Joe". Re-developed and published for the Sega Master System by Parker Brothers in 1989. Unofficial MSX conversion based on the ColecoVision version by Muffie of ICON Games in 2008. Unofficial ZX Spectrum 128k remake "Preliminary Monty" was programmed by Andrew Zhiglov in 2009. Official remake for the iOS by Jim Pavloff in 2012. One of my fondest early memories of computer gaming was of a video recording one of my gaming friends had recorded of his completing a level of Montezuma's Revenge. It was recorded as the first entry for a 3-hour video tape filled with footage of games that would become my favourites not long after. Many times in my youth, I would try to record my own gaming compilation video, but rarely did I have the patience to do more than half an hour. Nowadays, we have YouTube, which has completely killed the idea of a VHS-mixtape. Oh well. At least the memory remains. Little did I know back then, that Montezuma's Revenge was actually one of the biggest titles of its time, because I only got properly introduced to computer gaming in about 1986 or 87. As it happens, the game was made the Game of the Month in December 1984 by the gaming press, and for many, it was easily the game of the year. But it was developed in 1983 by Robert Jaeger from Mark Sunshine's concept, and although not entirely finished and completable, it was developed to be played from a disk instead of a cartridge, and so there was more room for better music and sounds. The preliminary version even featured an end-game boss, which is pretty much what made the game uncompletable, since you couldn't kill it. For this comparison, I shall try my best to compare the official finished product with the original game as well as do the regular stuff. At the time of writing this bit, the official Atari 800 version has a rating of 8.5 from a total of 2,356 votes at Atarimania, and is at #11 on the Visitor Top 25 list by ratings. 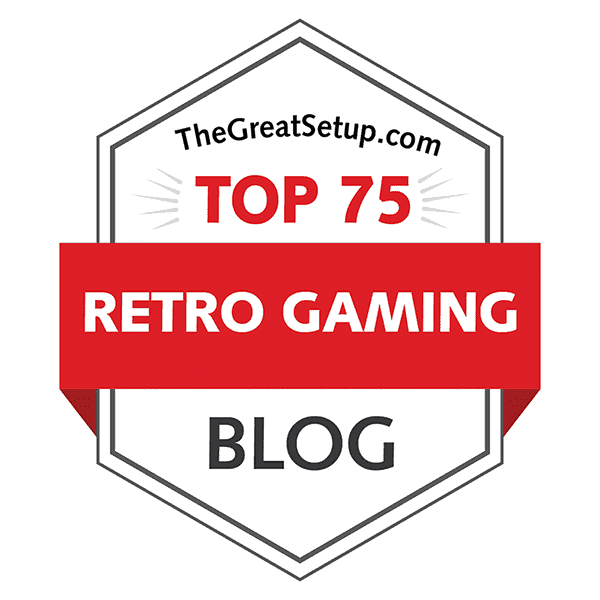 From the other two Ataris, only the A5200 version has any votes at Atarimania, where the rating is 7.3 from 29 votes. At MobyGames, though, the A2600 version has a score of 4.2 from 5.0 from 6 votes. Also, the Apple ][ version has a 4.0 from 5 votes at MobyGames, the ColecoVision version has another 4.2 from 3 votes, and the Sega Master System version has a 3.0 from 9 votes. At Lemon64, the is ranked at #74 in the Top 100 Lemon voters list based on at least 50 votes. Finally, the two Spectrum versions are rather wide apart - Panama Joe has a score of 6.99 from 122 votes, and Preliminary Monty has 8.23 from 83 votes. The official iOS remake will not be included in the comparison, mostly because I have no way of playing it, but it looks to be rather well-received with 4.5 out of 5 from 66 votes at iTunes app store. Anyhow, from the looks of it, this is going to be one interesting comparison. Sure, it's yet another platformer in a neverending series of still more platformers, but this time we're talking about one of the true grandaddies of all platformers, and although it's not quite the first one to combine the game's theme with the genre (Pharaoh's Curse and Spelunker predate it), it's certainly one of the more memorable ones, having been converted for many more machines. The game takes place inside a labyrinthine underground pyramid full of traps, obstacles, enemies and treasures. Similarly to other pyramid-themed games, the player is shown the rooms one by one in a flip-screen manner, and like the other two games mentioned, Montezuma's Revenge plays more like an arcade/adventure game, where you must pick up items to get further in the quest. In this case, this means opening doors with keys, using torches to light your way, killing enemies with swords and whatnot. While the pyramid is nine floors deep and has a total of 99 rooms to explore, the first two levels only contain one of two halves of the pyramid, and the full pyramid is opened for the third level and onwards. There are nine levels of difficulty in the game, all of which contain certain modifications to the rooms, which make you rethink your routes and strategies, such as the rearrangement of items, blocking or opening up certain paths, and more dark rooms and fewer torches. Had the original plan to release the game as a full disk release gone through, Montezuma's Revenge would have been the first adventure/platform game ever to have a proper end-game boss fight. As such, I suppose the honour now officially belongs to Super Mario Bros. If you can think of any earlier examples, please do tell. What I enjoy the most about this game is its precision-oriented nature. There is no inertia, and the sense of gravity is relatively primitive but works perfectly within the context. Our hero, Panama Joe (or Pedro, as he was originally called) walks around with a determination and haste that easily rivals the humour in Mario's movement, but this hero can only jump a certain height. Again, though, the game is designed in such a way that any more advanced jumping mechanics would have made the gameplay unbalanced. That said, the game can be rather unpredictable, and modern gamers who have gotten used to extra jump abilities such as double-jumps and jetpacks, might get a bit shocked that a simple jump is all you will get, and everything you collect will be of some use. The only problem is that you have a slightly limited inventory, which can only hold 5 items at maximum, so you have to use some of it before you can pick up anything more. For some reason, even collecting more treasure is impossible with a full inventory. In other words, lots of backtracking is to be expected in this game. Come to think of it, this could well be the earliest platformer to exhibit this necessity. This is one of those games that I would actually go so far as to claim that for any gaming enthusiast, it should be a requirement to play at some point in their early gaming years to learn about the history of not only the origins of this particular genre, but the makings of new elements that would become completely regular elements soon enough. Although some of this drivel could be my 6-year-old self speaking for some part, the truth is that this is still an excellent game, and can easily be recommended to anyone. Even young gamers of today should be exposed to this one, because it's not unfair in any way, and offers just enough charm, mystery, challenge and replay value to make the next generation hopefully more interested in history. Starting the game is fairly simple for most versions. Apart from the ZX SPECTRUM, every other platform had Montezuma's Revenge distributed primarily on a cartridge, or to a lesser amount, on a disk. But then, the original Spectrum tape version only takes a minute and 40 seconds to load, so it's not too bad at all - some disk games take longer to load on the C64 and Atari. That said, there are European cassette re-releases for both the ATARI and the C64 from Databyte, but I haven't been able to locate either of them on the internet thus far, which is why I skipped the Loading section this time. For most versions, the game is controlled with a joystick, although the keyboard has to be used to change the levels before starting the game. Naturally, the APPLE and DOS versions have the keyboard as an option, and the two SPECTRUM versions use the keyboard by default. The fire button makes your man jump either straight up or into the direction you happen to be walking, and otherwise the four main directions make your man walk around and climb ladders and ropes. As the game has no sense of inertia or other special controllability features at all, this is pretty much all there is to it, really. Although the purpose of going through the maze-like pyramid is to find the exit, the basic idea of the official game is nothing more than to collect as much treasure from the pyramid as you can before you lose all your lives, and kill some enemies while you're at it to get some extra points for your efforts. The preliminary version presented another goal, which was to reach the undead Aztec emperor Montezuma II's Treasure Chamber and win him in a battle, which was unfortunately never finished so that the prototype could have been completed. Interestingly, though, the official SPECTRUM conversion (Panama Joe) uniquely features the ending battle in an official form instead of having you fall and jump through a series of ropes and pipes in a psychedelic emptiness, collecting all the coins you can get your hands on. Too bad the ending is stupidly easy to reach - once you get there, that is; you just have to reach the green cauldron (?) at the bottom of the screen, so there's no real fighting involved here. Also, too bad the ending is not worth the trouble. Indeed, you might want to stick with the other versions if you're playing the game for the sake of getting a good ending. Or, in fact, getting yourself a good gaming experience at all. While the SPECTRUM version feels like a slower version of Jet Set Willy (a classic on its own merits, certainly), the original ATARI version runs with a certain quickness to it, which makes the game both challenging and enjoyable, rather than docile and boring. Also, most of the rooms on the Spectrum have been slightly rearranged to fit the very different graphics style. There is also a bad problem regarding collision detection, which can cause a spider on a lower level to kill Panama Joe - only the collision areas need to touch, which can be surprisingly wide, and will undoubtedly cause many moments of frustration. However, easily the most irritating bit about the Spectrum version is that you only have one set of lives, while the original and most of the other versions allow you one full recovery from the spot you first Game Over'd at - with your collected score taken away, of course. From what I could tell, the ATARI 5200, ATARI 800 and COMMODORE 64 versions play very much the same, apart from the A5200 version requiring a proper A5200 joystick to make it possible to play the game at all - having any other joystick plugged into the A5200 will make poor Panama Joe stuck walking automatically to the right. And there is also a minor difference in choosing the difficulty settings: all three versions share an otherwise similar-looking start-up screen, but the C64 has the game title on it along with instructions for choosing the difficulty level. On both of the Ataris, you need to rely on either lucky guesses or the game manual, which is pretty damn irritating when playing the game on an emulator. So, to make things easier for everyone out there, you can choose the level in the ATARI 800 version with the SELECT button (F3 on Altirra) and keys 1 to 3 on the A5200, but only on the first screen. The 128k SPECTRUM version plays otherwise just as well as the original, but it suffers from two minor things. The size of the screen causes a slight narrowing of the rooms, so the author has had to redesign most of the rooms to accomodate the smaller screen size. It makes certain bits more prone to cause you unnecessary deaths. The second problem is still with the collision detection, although not as much as in the earlier Spectrum version, but it makes the game require more pixel-perfect jumping and some slight rethinking into certain situations. That doesn't make it a bad conversion, but merely different enough from the original to require a new title. Still, compared to the original, it is less player-friendly, and so it has to settle for a lower spot. The APPLE version isn't too much different from the original, but has a rather unfortunate keyboard controllability problem, which pretty much ruins the whole game, unless you have a joystick. If you jump over an obstacle, your man doesn't walk any longer, even if you keep pushing on into the direction with your controller. Instead, you need to let go of the key and start walking again. Also, if you do diagonals while climbing ladders or ropes, your man will automatically continue walking in the supposed direction you were heading in the first place, which might easily lead to your doom. As you might have guessed, the joystick option doesn't have these problems, but you would need to have one. Otherwise, it's a fairly good conversion, as the game speed is almost spot on, and while there are some room layout differences, it's not nearly as drastic as on either Spectrum. Likewise to the above, the DOS version has a curious tackle on the controls. I tried it first with the keyboard, for which you are given to choose three different jump buttons - up, right and left. This really made me nervous about even trying it. Unfortunately, my expectations were exceeded by miles. Some of these problems I have encountered a few times before, and they seem to be common with really old DOS games... First of all, when you start walking into any direction, Joe will just go one step and then make a long pause before he continues - that is, IF he continues. Sometimes you need to start walking a second time before he actually starts walking. Even then, keeping him going in one direction longer than the program wants you to will make him automatically continue for an unknown period of time. I want to believe that these are compatibility problems with DOSbox and such, but the problem is, most of us don't have the properly aged hardware to test games of this age anymore. Having three jump buttons seems like only a small inconvenience compared to the utter lack of playability otherwise. Anyway, after having tried the keyboard controls for more than enough, I went for the joystick option. Happily, like the APPLE version, the game became rather playable! There are still a couple of problems, though: anything that is animated on the screen flickers like an agitated butterfly, making the game hurtful to look at, and you need to be slightly off the spot to get on any ladders or such. Still, with a joystick, it's slightly more playable than the APPLE version, but not by much. The SEGA MASTER SYSTEM, being a console with a pad controller equipped with two fire buttons, has been made to utilise the second fire button in a rather helpful manner: when you have collected an amulet that makes you immune to enemies for a short period of time, this version doesn't automatically use it like all the others - you can activate the amulet with button 2 at your will. Other gameplay differences in the Sega version are mainly done for the room layouts, and at first, the most obvious one is for the Treasure Chamber, which is now a single screen, and has a trap set for you - different one for each level, too. You will notice, though, that there each difficulty level will give you numerous new challenges in forms of new room layouts. Curiously, the Sega version has also been blessed with more enemies, such as mummies and bats, although the original prototype did feature bats - this is their only official appearance. Last, but certainly not least, the Sega version has 11 levels of difficulty instead of only nine, and you can choose to start from one of the first six levels instead of three. Although it doesn't necessarily look all that much like it, the COLECOVISION conversion is actually very close to the official ATARI 800 release - only the graphics make it feel a bit different. Sure, it has some minor changes made for some rooms to fit in better with the different screen resolution, but the room layouts are as close to the original as they can be. The biggest difference is really in the game speed, which is surprisingly quite a bit faster than the ATARI version, even in NTSC mode. If anyone's curious, I did use a stopwatch for this one: crossing a room as straight as it is possible to do, will take 2 seconds and 7 tenths on the NTSC Atari, while the COLECO Joe can run across the room almost half a second quicker (2:39). Of course, this causes a bit of adjustment problems for us old gamers with bad reacting skills, and the quick controls also require a seriously good joystick, which the Colecovision doesn't have, unfortunately. From Coleco, we get neatly to the relatively recent MSX conversion. You already know about Muffie, who helped to bring the earlier latter day MSX conversion of Mikie from the Sega SG-1000 version to an emulator-friendly ROM mode, right? Well, he also converted the Coleco version of Montezuma's Revenge for the MSX a few years ago. The conversion is spot on, of course, with a couple of mostly unnoticable Muffie ingredients to go with it, but happily, he also took the game speed a notch down. Still not as "slow" as the original, but it's certainly more playable than the Coleco version - crossing a room takes 2:56 now. Otherwise, I have found nothing worth noting about this one. As expected, the ATARI 2600 has a rather stripped down version of the game. The basic gameplay mechanics are still there, but the play area has been reduced to 23 rooms, and there are only 3 difficulty levels to play - none of which are selectable at the beginning. At least the gameplay has the same feel to it as on the other Ataris, which only points out how well the conversion team was able to squeeze the game in its very basics for the primitive A2600. Most people who have played Montezuma's Revenge in any form, have most likely played it as either the official ATARI 800 release or one of its straight ports. Some it might come as a bit of a surprise, that the original disk version had an animated intro sequence. For the ATARI 5200 and 800, Sebor and Halliday had to cut down all the intro bits amongst quite a lot of other things to keep the final product within 16k, while the original would have taken around 48k. But let's start with just the intro bits and loading screens where available. Loading screens and intro sequences. Top row, left to right: Atari 800 proto, Atari 800 official, Atari 5200. 2nd row: Commodore 64 (left) and ZX Spectrum 48k (right). 3rd row: ZX Spectrum 128k. 4th row: DOS (left) and Colecovision (right). 5th row: Apple ][ (left) and MSX (right). Bottom row: Sega Master System. I think this already gives a fairly comprehensive idea of how all the versions differ from each other in graphics, but of course we must be thorough. 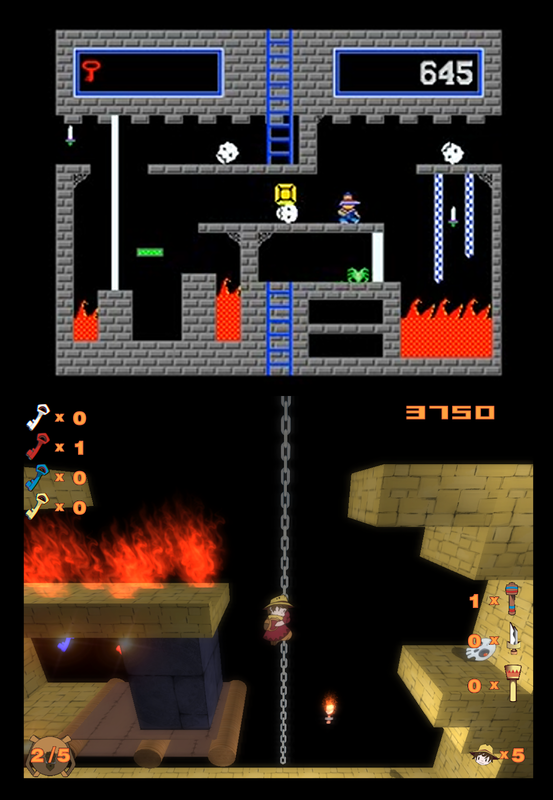 The original prototype has a very elaborately animated intro sequence, beginning with Pedro climbing the ladder up to the platform and walking to the right. Then, the title gets drawn on the screen with the "Revenge!" written in a nicely hand-written method, and the credits revealed slowly beneath it. Then, Pedro walks to the right, and comes to the screen where he is introduced. After he climbs down the rope, he comes to the first screen in the game, which I will not show here because it's part of the game. Having completed his object in the first room, he opens the door to the left and walks out of the room into another unique room, which shows us the Hall of Fame. For the A5200 and A800, the full intro sequence has been cut off, and Panama Joe (different hat, different man) is thrown straight into the action. The game starts from a different-looking location, but it's basically the same thing. You can already see here, that the lives are shown straight under the inventory display, and the texts have been taken away. The number shown next to the inventory display depicts the current difficulty level - the original doesn't have such an option, since you could only play it up to Montezuma's chamber at best. Although the C64, SPECTRUM 48k, APPLE, COLECO, MSX and DOS versions follow the same pattern, all of them have some sort of a title screen. For the C64 tape release by Databyte, as well as the two SPECTRUM versions, the conversion team has prepared some sort of a loading screen - the new 128k Spectrum version clearly being the best one of the lot. The new MSX version also has a unique additional intro screen, which I suspect is some sort of a trademark thing for Muffie. As the unofficial remake for the 128k SPECTRUM was made to be a fairly exact copy of the official Atari game, it lacks most of the extra material from the prototype, but at least it has been given a completely new intro sequence. Here, Monty (as he was called in Russia, where this version hails from) climbs up the ladder, the title stuff comes on the screen like it does in the original prototype, but then Monty walks to the left, which is why the left-to-right order looks a bit silly. Frankly, it's more logical than the original, as you can see the pyramid's top this way, but it's almost a pity that the intro ends up in the same screen where the official game starts. It would have been nice to have a full, finished version of the original Montezuma's Revenge on some machine at least, but there you go. It's still good to have a good version on the Spectrum at last. Pity, though, that it requires one with a disk drive. And finally, there's the SEGA MASTER SYSTEM intro, which has a suitably different take on it to go with all the rest of the differences in the version. Screenshots from the original 48k prototype version on the Atari 800. This is how the game originally looked. Although most of the graphics look very familiar, the bottom half of this little screen compilation should look a bit strange. The prototype version, you see, would show a separate screen for showing the remaining lives - when you lost one, and when you gained one. When one Pedro would die, another one would take its place and walk to the spot on the screen you last arrived to it from. When you scored enough to gain an extra life, the same screen would appear with a bonus Pedro coming into the line. Then, there's the screen with Montezuma II himself, whose left foot is animated to go up and down, and when it comes down, the whole screen will shake as if an earthquake took place, and you would fall through the floor. Finally, we have the "enter your name on the Hall of Fame" screen, which is nicely thematic. Screenshots from the official 16k release on the Atari 800. For the 16k version, some of the little details had to be cut off to save some memory space. But still, the game feels basically as colourful as before. The rolling skulls are glowing in wildly varying colours, as are the reappearing chain traps and platforms. For such a huge reduction of material from the original prototype, graphically the official release looks surprisingly close to the original. 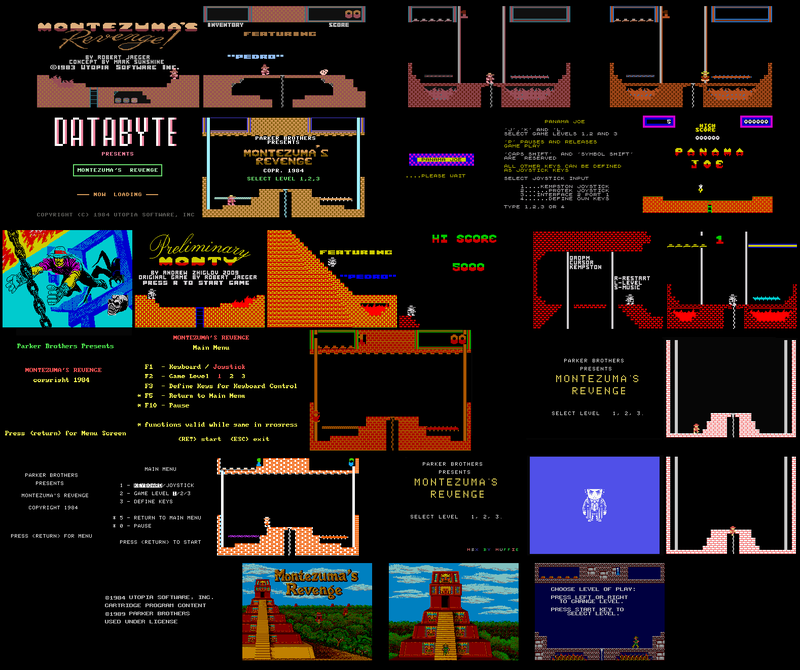 Screenshots from the Atari 5200 version. The A5200 version looks exactly the same as the above, but there is a slight change in the palette brightness, unless it's a weird emulator-related thing, which I highly doubt. Honestly, I prefer the game being slightly brighter than not. And there really is nothing else to say about it. Screenshots from the Atari 2600 version. I could finish off the ATARI section with saying that the A2600 pictures speak louder than what I could say. But still, as with the gameplay, the style of the graphics and the basic feel of the game is surprisingly close to the original. It's not nearly as good in quality, but it's surprisingly colourful and it does present every necessary thing as well as it can, really. Although the C64 version lacks the wildly colourful skulls, platforms and chains, the basic palette feels much more vibrant than any of the ATARIs. Also, most of the little details are back from the prototype, which is a nice plus. The dark bits have been made darker for some reason, and even the coins pointing down have been taken off to make the darkness feel darker. But then, the Treasure Chamber section has been made a bit different - although nothing changes colour at first, once you get on one of the pipes going down, you will go through a few similar-looking screens, which will change the background colour to darker and darker a few times, until you reach the bottom and start the next level. If I were to choose a favourite from all the versions that look similar, I guess I'd pick the ATARI 5200 version, because it has brighter colours than the other Ataris, and still has the colourful skulls and all that. When I try to find any complimentary words for most APPLE ][ games, I usually end up wasting time with a blank mind. The thing is, because the machine wasn't built for entertainment purposes, the games would suffer in one way or other, and mostly with many ways combined. This time, while the graphics are rather acceptable for APPLE ][ standards, there are some cringeworthy graphical problems. The pixelation, for example, is sloppy at best, and often the collision area of your man will get shown on the walls as a sort of a black aura around you. As if the bad pixelation weren't enough, the whole palette in the game seems to consist of 6 colours: white, black, orange, green, blue and magenta. At least the animation is alright. To be fair, I'm not an expert on APPLE ][ graphics in that I should know what the machine is actually capable of, but then I'm only comparing the game to other versions of the game. Screenshots from the DOS version. I couldn't be bothered to take more than three screenshots for the DOS version, because all the animated sprites flicker like there's no tomorrow, and I had to take the DOSbox speed down to almost naught to make it possible to take screenshots where all the sprites would actually occupy the screen. Also, since there are only four colours in all (orange, red, green and black), all the rooms look a bit samey. You will be happy to notice, though, that the little details from the prototype have been kept in this version as well, and the basic graphic style is very much the same as in all the other similars-to-the-original, but that's really all the positive that I can say about the DOS version. Oh yes, and the fiery bits are NOT animated here. To be frank, I'm not very fond of the colour scheme in the COLECOVISION version - and consequently, the direct port of it for the MSX. It's rather bland compared to the other 8-bits, although it's certainly more colourful than either the 48k SPECTRUM, DOS or the APPLE version. What it does excel the other 8-bits at, is the screen resolution and better fire animation, which goes a long way to forgive the washed out colours. Too bad, that even with the higher resolution, there are no thematic details such as spider webs and vases scatter around the pyramid. Screenshots from "Panama Joe" on the ZX Spectrum 48k. "Panama Joe" on the 48k SPECTRUM plays, feels and looks more like Jet Set Willy, as I mentioned earlier. But Jet Set Willy has a larger map and is more colourful. The pyramid in this version is completely made of yellow-and-red bricks, and all the details and screen characteristics are at a bare minimum. Most of the rooms are so heavily modified that they're almost unrecognizable, and the animations are as slow as a pensioner with a walking aid. At least you get an ending screen with a Lego(tm) version of emperor Montezuma II. Honestly, I'm more impressed with the A2600 version, but I will only give this one a higher spot because it's closer to the original in map and room design. 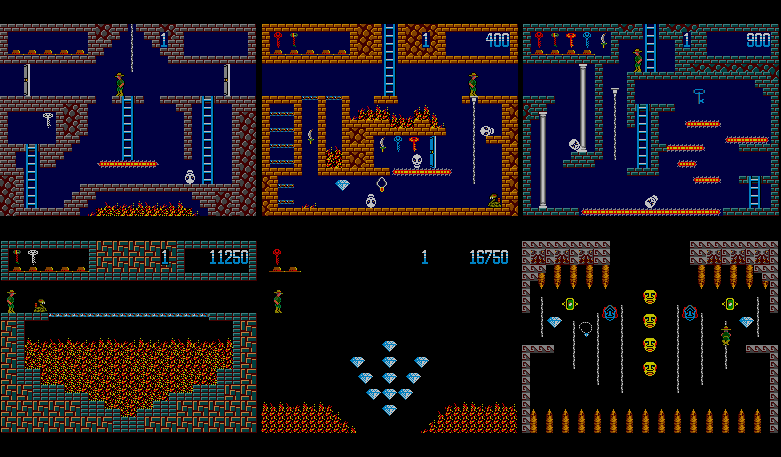 Screenshots from "Preliminary Monty" on the ZX Spectrum 128k. Now, this is more like it. Although the main sprite, as well as all the enemies, are monochrome (light grey), all the rooms are much more colourful here in "Preliminary Monty" than in "Panama Joe", and the game speed is very close to the original - in fact, it's just slightly quicker here. Also, the animations are as good as you would ever wish for them to be. But as I mentioned before, the rooms are a bit narrower due to the screen size, so the graphics don't match up properly with the original, and even though the game is now running on a 128k machine, the vases and spider webs are missing. Sure, some colour clash is unavoidable, but still, quite an achievement, I have to say. Screenshots from the Sega Master System version. And here's the big one. For the SEGA version, Parker Brothers' team decided to let go of the outdated and blocky Atari graphics, and went to update the game's visuals about 90%. The style of animation and the game speed is still very much as it was originally, but everything else looks completely new. There are now multiple types of jewels and gems to collect, all the keys have a different look to them in addition to being in a different colour, and all the enemies and room graphics now look much more interesting and... dare I say it... realistic? Well, as far as the hardware allows I suppose. I admit, it doesn't have the same nostalgic value as the original graphics, but I would be an idiot not to say the Sega version didn't look the best of the lot, because it just simply does. The results may look a bit harsh, but remember, it's nothing but a list in some sort of an order. If you didn't read all of the above, you might want to do so before commenting. As some of the versions are so completely different from one another, it is difficult to place them anywhere at all on the list, so it is necessary to do a pros and cons list before putting the lot in an order. And this is what you'll get. By far, the most boring aspect of this game is its sounds, although when compared to other similar games of the time, Montezuma's Revenge does have a good amount of charm in it. For most versions, you get pretty much the same set of sound effects as are in the official ATARI 800 version: walking tap-noise, jumping whoop, landing thump, the 5-note extract from "La Cucaracha" when you pick up any item, another thump noise when you puff up into smoke, a little clicky sound for opening doors, another little melody when you receive an extra life and then some psychedelic beepy melody when you reach the Treasure Chamber. The original prototype features a theme tune, which is played only during the intro sequence - a variation of Julius Wechter's well-known tune "Spanish Fly", best known as performed by Herb Alpert and the Tijuana Brass. The same tune has been implemented for the 128k SPECTRUM version as well, but it also features a unique in-game tune, which has been turned off by default, but you can hear it by pressing the 'S' key during play. If you would rather listen to the sound effects, the same key will bring them back again. True to form, the 48k SPECTRUM version even lacks part of the regular set of sound effects. The DOS version doesn't fare much better, since it utilises the PC speaker, which at the time was only known to be able to produce simple beepy sounds, but it does have single-channel beepy versions of all the game's sounds. Strangely, the APPLE version falls between these two: it also plays only single-channel beepy effects, but the most recognizable ones that you would normally link to this game, are now gone entirely, and in their place are some non-descript bulk sounds. But the most surprising thing about these three together is, the ATARI 2600 sounds better than all of them. Sure, it doesn't have quite the same amount of sounds as the majority of versions, but it certainly gives us all it can. When it comes to sounds, the otherwise fairly similar COLECO-MSX twosome now come to their crossroads. While the COLECO version sounds much like the original ATARI version, the MSX version doesn't do noise sounds at all, only melodics, so your walking tap-sounds are strange low notes. (At least it does so on the emulators.) To make up for this, you get a theme tune for the title screen, which is actually taken from the SEGA version's title screen. However, because you will be spending most of your time in the game instead of the title screen, I have to give a little penalty for the MSX version. And that serves as a nice little bridge to our final contestant. After the said title screen, you get a cutscene, in which Panama Joe walks towards the entrance of the pyramid and finally goes in. During this cutscene, there is another piece of music, which hasn't been used in any other version: El Jarabe Tapatio (the Mexican Hat Dance). The SEGA can also boast of having the least noisy sound effects, while they still have a good quality about them. One can always argue that the faster melodic bits in the original and its ports are more fitting for the game, but considering the matter only in terms of sound quality, you can't deny the SEGA is an easy winner again. 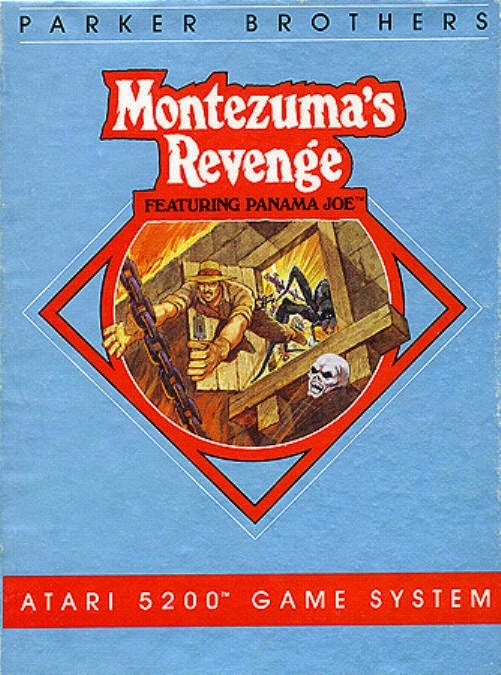 According to an interview of Robert Jaeger by DigitPress from 2009, he had the opportunity to release Montezuma's Revenge for the Nintendo Entertainment System in its infancy, but he opted out because of the video game crash and consequently having no confidence in Nintendo's future success. Having a Nintendo version would have probably made some of the other versions (such as Sega?) impossible later on, but it would have been interesting to see it happen. As it is, this is all we've got at the moment. Hopefully, some new programming whizzkids will take on the challenge and convert the game for the NES. Also, an Amstrad version would be nice to see some day. If I were to re-label this list now, I'd say that in this case, the games are in a compromised order. Most of it rings awfully true and even unfair, but since the majority up there has their bases in playability, I cannot argue against it all that much. The thing is, though... Montezuma's Revenge is part of that sort of historical gaming lot, which nowadays rely heavily on its original style, which is what gives it that extra nostalgic value to us old folks. The Sega version just doesn't cut it in that sense, no matter how far above it is in all the material points. Therefore, I would say that the best way to experience the game is on a real Atari 800 with a good joystick, because the A5200 doesn't have one. That's it for now, hope you enjoyed it! This blogger is now off to have some time off, but will be back as quickly as the time allows. Meanwhile, suggestions, corrections and other comments are still welcome!